• Evaluations of surveys for the Collins Isle area are being conducted, as well as surveys for the area adjacent to Bayshores Marina. Both areas are completed, but it is possible R.E. Staite (dredging contractor) may have to return for cleanup, which would take a day or so. • Currently, R.E. Staite is finishing up the final area for Phase 1 in the Newport Harbor YC mooring field. Once that is finished, Phase 1 will be complete. • Phase 2 is beginning immediately, focusing on the channel between Linda Isle and Harbor Island and on the back side channel of Linda Isle. A total of 1,200 cubic yards of contaminated material there must be barged to the Port of Long Beach for approved disposal. • Important information for those who live in the Linda Isle/Harbor Island channel, and the back side channel of Linda Isle: Dredging in these channels will be challenging, especially in the very small channel on the back side of Linda Isle. 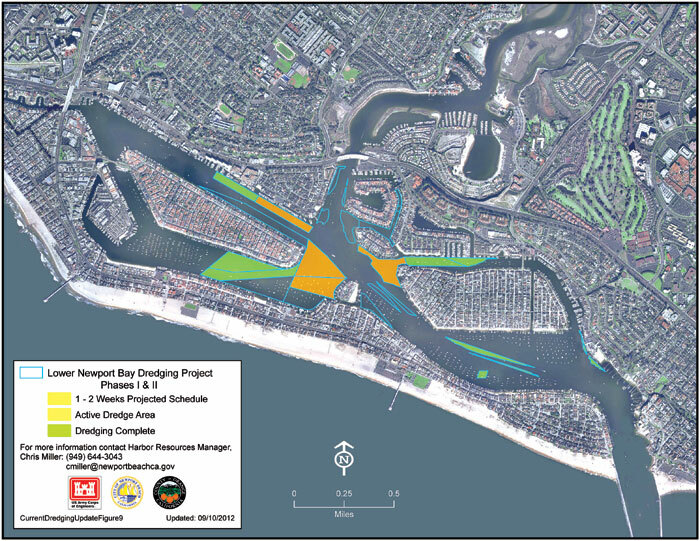 The city’s highest priority is to deliver the Port of Long Beach-bound contaminated material, located midway down the small channel on the back side of Linda Isle, by Oct.12. All efforts will be made to make this deadline, including the possibility of working 24-hour shifts, if needed. • Sept. 24: Linda Isle/Harbor Island channel dredging began. • Oct. 1: Back side of Linda Isle dredging began. All boats that encroach into this small channel were required to be removed. This includes any vessel side-tied to a float or any vessel that extends into the channel beyond dock fingers. R.E. Staite will be mobilizing in this channel during the week and will begin dredging shortly after that. Boaters who have small electric or fuel-powered runabout boats are being asked to tuck them behind their docks or on the land side of their side-tie docks. Vessels cannot protrude beyond the dock. Wave action is expected in the small channel while dredging. Boaters should securely tie their vessels and use lots of fenders. • Any vessels that have not been moved may put the project in jeopardy. Because of the delicate nature of dredging in this narrow channel, it is imperative that all boats be removed, both for the project and to protect the boats. • Dredging in this portion of the channel is expected to last more than three weeks, so boaters should plan accordingly. Boaters in the channel will not have access to and from slips because of the size of the dredging equipment. • Boaters being displaced during dredging can call the Orange County Sheriff’s Harbor Patrol for information on obtaining a free mooring, at (949) 723-1002. Also, slips may be available at the Balboa Yacht Basin marina off Harbor Island Drive. Contact Dave New at (949) 673-0360 for sizes and availability.